My brother and I had a list of movies on rotation throughout our childhood. And one of our undeniable faves? Grease, of course! I loved the singing, the dancing, the absolute absurdity of it all. (And looking at John Travolta sure didn't hurt.) 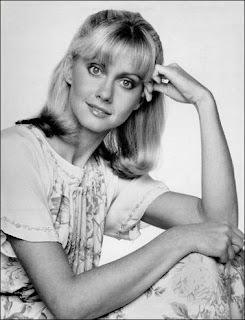 But every time I watched, I was left with just a twinge of guilt ... because Olivia Newton-John was just perfect. From her blonde hair to her big blue eyes, her sweet voice with her Australian accent to her fab moves at the high school dance, I just wanted to be her. And I was obviously not alone, as Grease is one of the most popular movies and most frequently done shows of all time! Born in Cambridge, England in 1948, Olivia was the granddaughter of Nobel Prize-winning physicist Max Born. At 5, her family moved to Melbourne, Australia, where she began singing and performing on TV as early as 15 years old. After a short run with a self-formed girl group, Sol Four, Olivia won a talent contest on the TV show Sing, Sing, Sing. She recorded the US album Let Me Be There in 1973, which catapulted her to superstardom with a Grammy Award for Best Country Vocalist. And with the offer to be in Grease in 1978 -- a role she originally turned down because she feared that at almost 30, she was too old to play the part -- the rest is history. The role of Sandy -- the sweet, innocent girl from Australia who captures the heart of John Travolta's Danny -- catapulted Olivia to superstardom. Roles in movies such as the critically failed but cult favorite Xanadu -- the movie with the ever-popular roller skates and people outlined in purple -- followed. So did a stunning five #1 hits and 15 top 10 singles on the Billboard charts, including I Honestly Love You and Don't Stop Believin'. So did collaborations with megastars like Andy Gibb and even an Order of the British Empire bestowed on her by Queen Elizabeth in 1979. During the 90s, Olivia unfortunately suffered a bout with breast cancer. 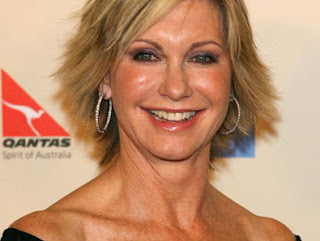 But even this was not enough to dampen her positive spirit or her glowing visage, as she worked with charity after charity and even set up the Olivia Newton-John Cancer Centre on the Austin Campus in Melbourne to educate people about the disease. No one can say Olivia has not worked tirelessly with a variety of different charities, including the American Red Cross, Environmental Media Association, the Women’s Guild of Cedar-Sinai Medical Center, the Rainforest Alliance and Concept Cure. Through all of this, Olivia has looked absolutely stunning. Her signature blonde locks -- whether left long and flowing in the 70s, sheared short in the 80s or cut into a beautiful bob in the 90s and current day -- are the perfect shade of honey. And her big blue eyes are always accentuated just right with a small swipe of eyeliner, while her clear skin is free and glowing. And my fave part? The peach or pink lipgloss that has accompanied her throughout her entire career! Today, Olivia is still singing and acting occasionally, and continuing her charity work. She is truly the exemplification of a Beautiful Belle.